OVERVIEW:200 Hour/300 Hour/500 Hour Yoga Teacher Training Course Certified by Yoga Alliance. Unearth the treasures of the great Ashtanga Yoga style at Rishikul Yogshala. Undergo deep internal cleansing and purification towards infinite unification with the celestial and the core within. Gather the surge of enlightenment and experience the divine union of the heart with its physical and psychical presence. Peel the layers of the traditional ‘eight-limbed’ art form during Ashtanga Yoga Teacher Training with us. Ashtanga Yoga, one of the most ancient systems of Yoga, after Hatha Yoga is a phenomenal manifestation of Vanama Rishi’s records and teachings on Vinyasa (Linking Breath Movement), Dhristhi (Gaze or point of focus), Bandhas (Locks), Mudras (Gestures), and Philosophy (the Yogic Way of Life as interpreted in the Yoga Sutras of Patanjali) as depicted in the great yogic text by Vanama Rishi, ‘Yoga Korunta’. The Yoga style is a derivative ‘eight-limbed path’ aimed at complete internal purification for unfolding the celestial projection of an entity (unfolding the true Universal Self). Ashtanga Yoga is both an external and internal practice wherein the external practices discuss the Yamas (moral codes), Niyamas (personal conduct), Asana (posture), Pranayama (breathwork), while the internal practices are Pratyahara (withdrawal of the senses), Dharana (Concentration), and Dhyana (Meditation). An ideal Ashtanga Yoga practice is a perfect amalgamation of Vinyasa and Tirasthana (a union of the three point of action). Vinyasa symbolizes a rhythmic linking of the breath with the movement of the body and the mind, while the state of Tirasthana is a unification of the three points of attention; Asana (posture), Pranayama (breathing), and Dristhi (gaze). These when performed in accord with each other fulfill the purpose of purification of the entire body, its mind, and soul. This union is ‘Ashtanga Yoga’ – the route to a revelation of the true Universal Self. When this deep internal and external purification process reaches its destination, complete mind control takes place which eliminates the venoms that tarnish the purity of a human soul and fall in the way of the complete realization of the Self. Ashtanga Yoga is the ultimate tool for the elimination of this obtrusion and clearing the Ashtangi’s path leading to the state of Samadhi (a still meditative state) for the attainment of utter and complete enlightenment of the body and mind. The legend of Ashtanga Yoga dates back between 500 and 1500 B.C. when the great sage Vanama discussed it in his manuscript ‘Yoga Korunta’. The Rishi documented his sacred manuscript in Sanskrit on the sheets of palm. The manuscript contained sequences and series of yoga postures along with Vinyasa, Drishti, Bandhas, and Mudras. While the sage’s legendary book of ‘Yoga Korunta’ was preserved in the library of Calcutta University, much of it got ruined due to corrosion by the ants. However, years later, the bundle of palm sheets, i.e., the great manuscript was rediscovered in the 1930s by a yoga master and a scholar of Sanskrit Sri Tirumalai Krishnamacharya along with his disciple K. Pattabhi Jois during their expedition to the Calcutta University Library. Worked by K. Pattabhi Jois and B.K.S Iyengar under the guidance of the Guru Krishnamacharya, the manuscript was explored, studied and further translated which came to be known as the ‘Ashtanga Yoga’. The Patanjali Yoga Sutras are inspired by the teachings of Yoga Korunta and is a fine expression of Rishi Vanama’s works. Certain evidence in the findings of Yoga Korunta suggested that Ashtanga Yoga might even be 3000-4000 years old. With the discovery of Yoga Korunta, Sri T. Krishnamacharya, along with his disciple Sri K. Pattabhi Jois decided to devote their lives to this unique yoga style and carry the tradition of Yoga under the name of Ashtanga Yoga forward. The teachings, carried forward as a legacy by Sri K. Pattabhi Jois were imparted at his institute called the ‘Ashtanga Yoga Research Institute’ in Mysore, India. Owing to this, the yoga style came to be known as Ashtanga Yoga. Ever since, the art form has continued to spread across the globe, being chosen by the greatest sages all over the globe and has become the most practiced and popular yoga form on the globe. Sri K. Pattabhi Jois’s devotion to imparting the traditional Ashtanga is survived by his grandson Sharath Rangaswamy, who carries forward the Ashtanga legacy by teaching the style. The great book Yoga Sutras of Patanjali that discusses Ashtanga Yoga as the ‘eight-fold path’ is a compilation of the preceding knowledge of the sacred book ‘Yoga Korunta’. The primary purpose of Ashtanga Yoga is to help a practitioner evolve into a true yogi by helping shape and define the inner dimension of their existence. The evolution into a true yogi is a physical, psychological, and spiritual process that is instigated through the system, ethics, and discipline of the traditional science of Ashtanga Yoga. The yoga style paves the pathway to becoming a yogi at heart and the body, each incomplete without the presence of the other. Ashtanga Yoga is the door to reaching and expanding the inner light and creating that sacred space in which the yogic evolution takes place. Ashtanga Yoga instigates an intensive channelization of the flow of prana in the entire body and draws the entire flow upwards for mental and spiritual vitality, directed to reach the Self or the inner being. The purpose is to break-free from the illusion and reach the stage of complete consciousness. This act of channelizing the prana can not be performed without the aid of Ashtanga Yoga. As the energy reaches the brain during Ashtanga Yoga practice, creative and intuitive potentials are unleashed while the feelings of delusion, distractions dissipate away. The mind gains immense focus through the drishti unfolding the layers of the soul hidden beneath. This is another divine purpose. The heat produced during the Ashtanga Yoga travels through the entire body while stimulating its various systems, energy centers, and organs. The rewards of which are inescapable – a body and mind free from disorders and persisting ailments. The final purpose of yoga and Ashtanga Yoga is the attainment of Samadhi wherein the yogi dissipates into the divine and the celestial only to emerge as a one complete whole. This is the last step to ultimate liberation and a yogi’s re-birth as an enlightened being and one true Ashtangi. Our team of highly-revered Ashtanga Yoga Teachers shall take you through a deeply enlightening and invigorating sojourn to becoming an Ashtangi. The program curriculum has been designed in accordance with the fine standards set by the Yoga Alliance while traditional authenticity and expertise are prioritized in the same. 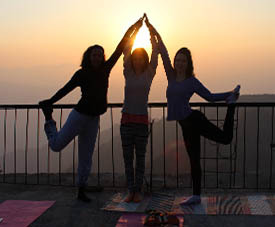 With references from traditional texts and yoga Upanishads such as Yoga Korunta and Yoga Sutras of Patanjali, the Ashtanga Yoga Classes at Rishikul Yogshala gradually unfold in various stages. The first step of Ashtanga Training is rousing of the Agni (fire) element within through the art form. The blazing flame that lies dormant is ignited through Ashtanga Yoga. Vinyasa, the movement breathing system, is the linked symphony of breath with the body movement and gaze (point of focus). When a continuous link is established, the flow of energy goes unperturbed through the entire body nourishing it to its core while aiding in deep purification process of the body and mind. Just like a metal begins to melt and flex with the exposure of heat, the body begins to flex and flow when the inner fire element begins to access all the areas of the body. This shall lead to a removal of all those restrictions and blocks that have been hampering the movement and growth. Through Ashtanga Yoga, you shall amalgamate the major life centers into a single rhythm and harmony, both mentally and physically. As the concentration shall increase, the outer barriers shall erode and make way for lightness and a sense of unison with the divine. The next stage is about feeding the Agni element and nourishing it to its core. And, this is where the breath comes into play as it is the one exclusive tool that works as a stimulator and keeps the fire going without dousing it. Through the study and practice of Ujjayi Breathing technique (the Victorious Breath), you shall nourish the fire element. This breath is what that links the body and mind. Through Ashtanga Yoga Asana and Pranayama, the energy forces (prana) are stimulated and kept in the body for an increased vitality and strength from within. This prana that flows through the various Nadis (or nerve channels) moves in an upward motion while the Apana (exhalation) moves in a downward motion. As the ‘prana’ and ‘apana’ unite at the base of the spine (Muladhara Chakara), the Kundalini energy that is initially dormant comes into life. With the awakening of Kundalini Energy during Ashtanga Yoga, you shall push the Shushumna nadi (the most vital energy channel) upwards all the way through the Sapt Chakras (seven plexuses) towards a higher state of consciousness. The seven chakras in the body are the greatest sources of power while the Kundalini being the ultimate. With the rising of the Kundalini energy and expansion of the consciousness, the Manipura Chakra that is a powerhouse of prana is aimed. The purpose is to trap the prana within the body and for the same, ‘Bandhas’ are applied. During the program, you shall learn to apply various Bandhas for converting the prana into spiritual flow while preventing its dissipation. These Bandhas help gain further access into the consciousness as when the Bandhas are removed, the trapped energy gushes into the brain, thereby activating and accessing its areas deeply leading to heightened creative and intuitive powers. During the study and application of the Drishti, you shall learn how to draw the attention inwards for bringing intense awareness and focus in your Vinyasa Movements. Drishti implies a point of gaze and is an excellent focusing technique to assimilate the body and mind in a single rhythm. During the Ashtanga Yoga TTC, our teachers shall take you through the learning and practice of all the 9 points of focus (Drishti) for acquiring the best and an ideal Ashtanga Yoga experience. 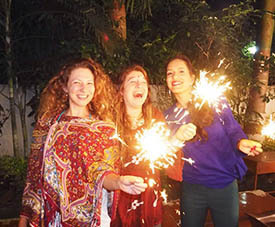 Through the yogic detoxification techniques, you learn to keep the body and mind pure for the prana to keep nourishing the fire element unobtrusively. 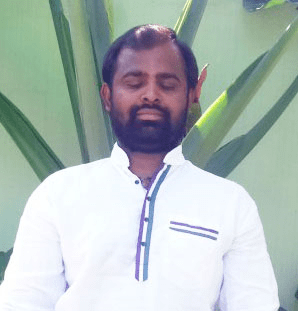 The primary detoxification technique (shat-kriya) is the Nauli Kriya. The purpose is to keep the body vitalized and the energy travelling upwards within. This kriya is taught and performed along with the Bandhas. Asanas are simply a state of being and are performed at both mental and physical levels. While the sequence and series are delivered in a pre-designed format, the importance of each is imparted to the students with just as vitality. The primary series constitute of Yoga Chikitsa (Yoga Therapy) aimed at healing, detoxifying, and aligning the body and mind. 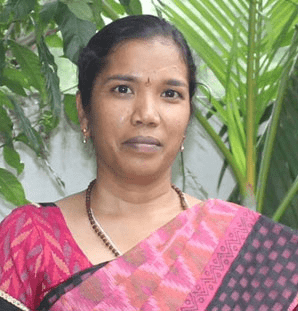 The Intermediate Series, known as Nadi Shodhana, is aimed at the purification of the nervous system by clearing the blockages in the energy channels. While the Advanced Series A, B, C, and D, known as Sthira Bhaga, assimilate the power and poise of the Ashtanga practice and requires an excellent level of flexibility and an unassuming nature. The sequence of each posture is highly crucial as each posture becomes a step for the other. During the Ashtanga Training with us, you shall acquire both the primary and secondary Ashtanga Vinyasa series. Our presence in various parts of the globe has blessed us with the opportunity to offer Ashtanga Yoga Training in the most yogic-ally decked locations. Enthusiasts from across the globe can select from any of these locations on the basis of their preference and ease. 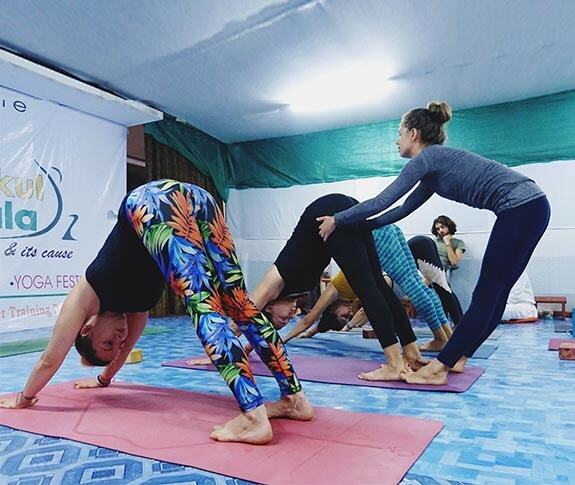 Whether you undergo Ashtanga Yoga Teacher Training in India or at any of our branch outside the country, we uncompromisingly maintain a consistent quality and premium standards in imparting the perfect learning across all our branches. Aspirants and Yogis can avail the opportunity to acquire authentic Ashtanga Yoga Classes from the revered teachers of Rishikul Yogshala at any of these locations. The land of Gods and Goddesses is set to ablaze your heart and soul with the intensive harmony and rhythm of the Ashtanga Yoga India form. 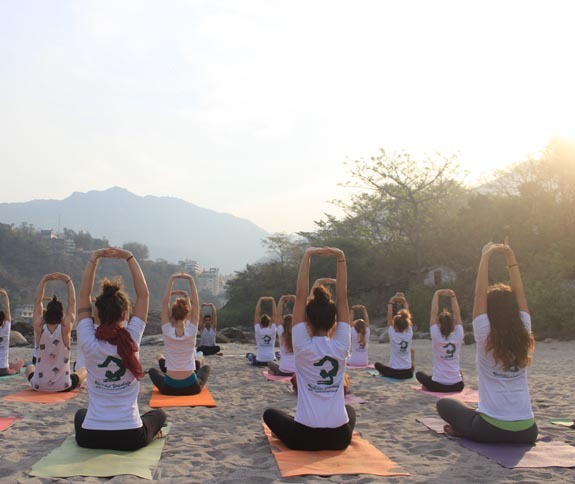 Rishikesh, the avowed ‘yoga capital of the globe’ and the dome of holy Ganges, greatest Sages and Spiritualists, is situated on the foothills of the Himalayas offering the ideal respite, history, and a sacred ambiance to undergo the most intimate learning of the Ashtanga Yoga style. 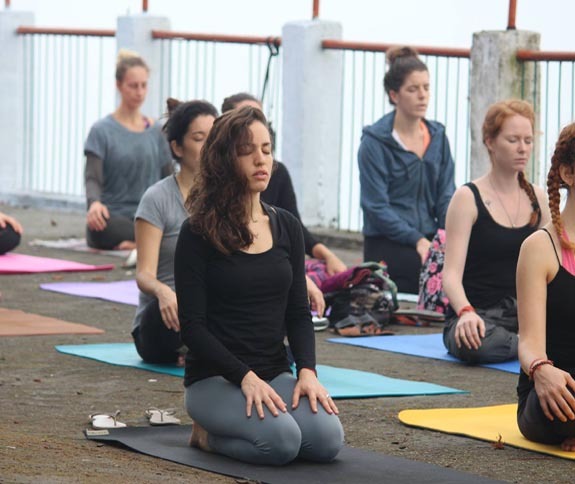 Experience an innate divinity and sacredness in the very air of this humble town during Ashtanga Yoga TTC in Rishikesh, India. 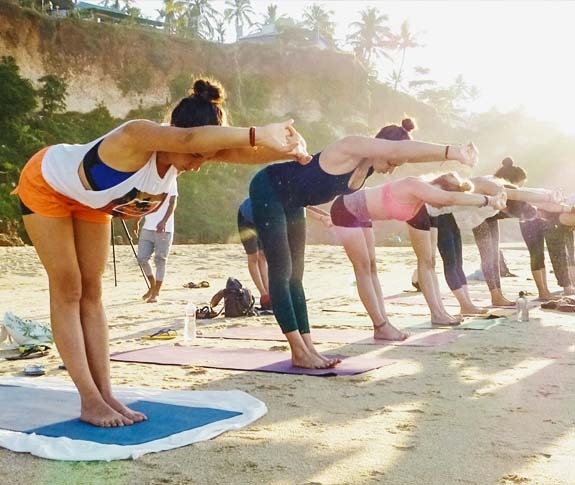 The tropical paradise invites the yogis, sages, and gurus into its embrace for a deep immersion in the yogic art form while commemorating with the ancient healing treasures of the land. During the Ashtanga Yoga TTC in Kerala with us, enliven the green opportunity to explore the Ashtanga Yoga system from its roots. Evolve as a true Ashtangi while discovering the Ayurveda legacy of this God’s own country with us. Additionally, explore the ancient healing system that continues to invoke the curiosity of the finest scientists in the globe for its natural healing powers during the training. Travel to the birth land of Lord Buddha and the meditation home of Rishi Nemi for finding a complete solace and tranquility. 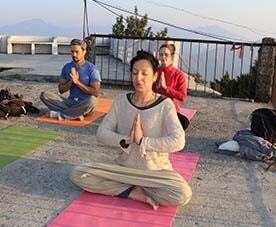 Find your salvation here during Ashtanga Yoga TTC in Pokhara, the green traditional valley of Nepal. The presence of the magnanimous glory of Annapurna Ranges, pagodas, temples, and the lush agriculture fill an entity with eternal natural charm. During the Ashtanga Yoga Training with us, go on the momentous journey of acquiring the yogic wisdom in the most salient and the highest peaks of the globe. 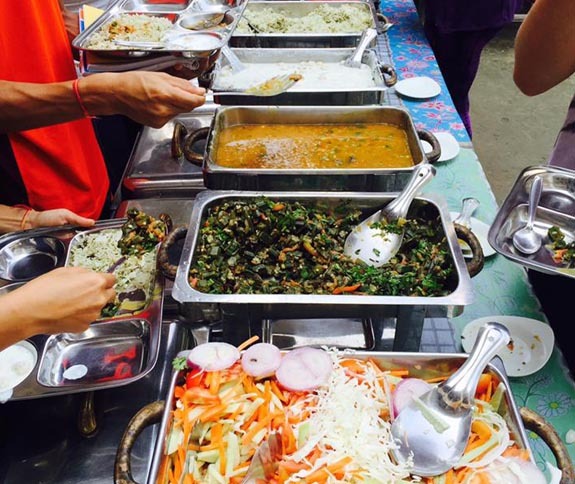 Visit Thailand, the eco-haven and the travelers’ paradise for a unique Ashtanga Yoga Training with us. The land of smiles opens its heart and soul to each yogi and offers something truly nurturing to each. This is a country unmarred by secularism or religious beliefs. The place advocates the religion of spirituality and the color of peace. Boasting lush green spectacular landscapes, Buddhist heritage, and healthy tantalizing food choices, the county of Thailand is indeed one of the most sought-after choices for budding yogis and wandering souls. During the Ashtanga Yoga TTC in Paksong, Thailand, it is your golden opportunity to witness a divine union of nature and tradition. Witness a magical colonization of various eras and wonders in the ancient Hoi An town of Vietnam during Ashtanga Yoga TTC with us. Soak in the breathtaking beach-side view while gaining the authentic expertise of the traditional Ashtanga Yoga form. Feed your heart and soul with an archaic visionary delight of this tinsel town. Let your spirit conjoin the traditional espionage and roots of this place while sinking into the eight limbs of the great yogic form with us. Fulfill your journey of being a true Ashtangi in the lap of nature and in the soul of traditional heritage mélange` and elegance. 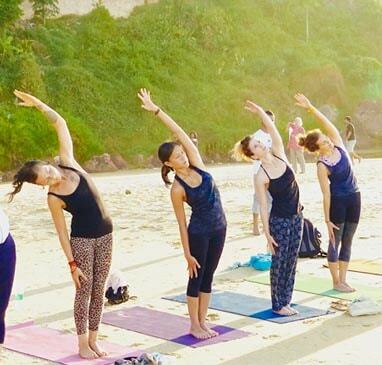 Delve into the traditional system and discipline of Ashtanga Yoga while absorbing a breath-taking view of the ocean and reach into the conscious as the placid ambiance of the Bilene strikes the chords from deep within. Learn the art of Ashtanga away from the distractions of the city and its noise – completely unperturbed on this beautiful lagoon, blessed with spell-binding natural beauty and charisma. Treat yourself with yogic delights and an assortment of the rarest kinds of fruits and vegetables during the Ashtanga Yoga TTC in Bilene, Mozambique. Yogis and Yoginis aspiring to take the first ideal step in the journey of Ashtanga Yoga may commence with our 200 Hour Ashtanga Yoga Teacher Training program. The aim of this program is to lay a strong yogic foundation for the practitioners. During the month-long program, we undertake the Ashtanga Yoga primary series and its theory. Best suited for those willing to take their learning and practice to an advanced level of Ashtanga Vinyasa Yoga Teacher Training. Only 200 Hour YTTC graduates are eligible to apply for this program. During this month-long Ashtanga Yoga classes, we shall cover the advanced practices of the science through the primary and intermediate series in both theory and practice. This highly intensive 2-Month long Ashtanga Yoga program is an amalgamation of 200 Hour YTTC and 300 Hour YTTC. The program is ideal for those aspiring to become yoga teachers and practitioners without exerting a break in between. A complete combination of the teachings of 200 Hour and 300 Hour yoga programs specializing in both Hatha Yoga and Ashtanga Yoga styles form the core of this program. WHO IS ASHTANGA YOGA COURSE IDEAL FOR? Aspires for balance, grace, rhythm, and poise from deep within. Holds innate passion for traditional authenticity and perfection. Desires to master one of the oldest and the most avowed forms of Yoga that is also the basis of several emergent yogic art forms on both primary and advanced levels. Is innately curious to unveil the art of Ashtanga Yoga under the soulful guidance of the masters of the art. Strives for internal purification and harmony. Aspires to emerge as a yogi of traditional principles and ethics. Aims to lead towards unearthing the purest yogic treasures for a complete unification and revival of the mind, body, and spirit. A deep internal purification and assimilation of the mind, body, and spirit. Restoration of equilibrium and harmony from within. Ability to challenge the body and mind for rigorous practices. Get acquainted with traditional Ashtanga Yoga practices under the vigilance of great yoga teachers. A reward of Yoga Alliance Validated Certification and the freedom to impart authentic Ashtanga Yoga teachings across the globe. Ability to exercise the gaze (drishti or focus) with respect to the body and mind for achieving balance, coordination, and perfect rhythm. Inhibit a healthy body and mind to continue the yogic path for life. Undergo a complete mind, body, spirit transformation into a polished yogi and an enlightened human being.